The University of Central Oklahoma celebrated the achievements of a record-setting 1,246 graduates during the fall 2015 Commencement ceremonies in Central’s Hamilton Field House. The milestone class came at the close of UCO@125, the yearlong celebration of Central’s 125th year. 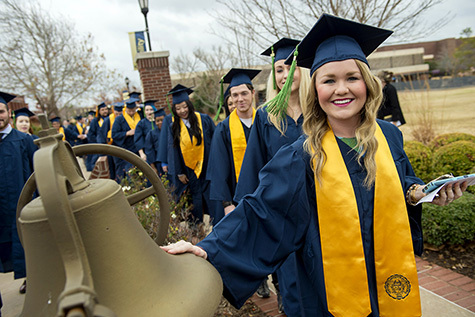 Pictured, fall 2015 graduates students touch the original bell that called students to class at the Territorial Normal School as they walk to Hamilton Field House for commencement ceremonies, a UCO tradition. 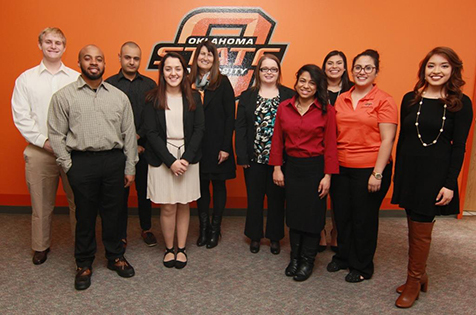 OSU-OKC recently named the students who will serve as Martha Burger Mentors during the spring semester. The mentors will support fellow students on campus by connecting with students at least once a week during the semester to make sure their mentees can access needed campus resources. Pictured are this year’s mentors with Martha Burger during a recent luncheon held in their honor. From left are Tanner Roberts, TJ Henderson, Maxim Romais, Ana Bugarin, Martha Burger, Roxanne Cobb, Debbie Rodas, Jessica Villar, Mayra Castanon and Karen Medina. Enrollment of first-time students for the spring semester of classes at Rose State College was 1,049, a 15.6 percent increase from last year’s spring enrollment. Rose State continues to grow. Recently, Rose State opened the first housing unit at an urban community college in the state. It opened at maximum capacity with 170 residents and continues to be an effective recruiting tool, attracting students from across the state.